This eel gets about 10 inches long and is known for having blue eyes and a yellow body. It is not very aggressive and will only eat very small fish and crustaceans; it should be fed a large meal every 3-4 days. 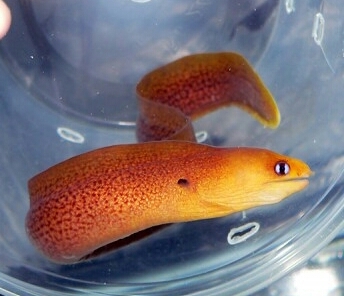 You need to be careful that you don’t place this eel in a tank with a lot of corals that sting, as the eel can get burns on its body, especially around the head. This species needs hiding places in the tank, and must be kept in an aquarium with a tight-fitting cover, or it will escape.